For the second consecutive year, the Carlton Football Club (Carlton FC) actively supported the ‘16 Days of Activism’, through its CARLTON RESPECT 16 Days awareness raising campaign. 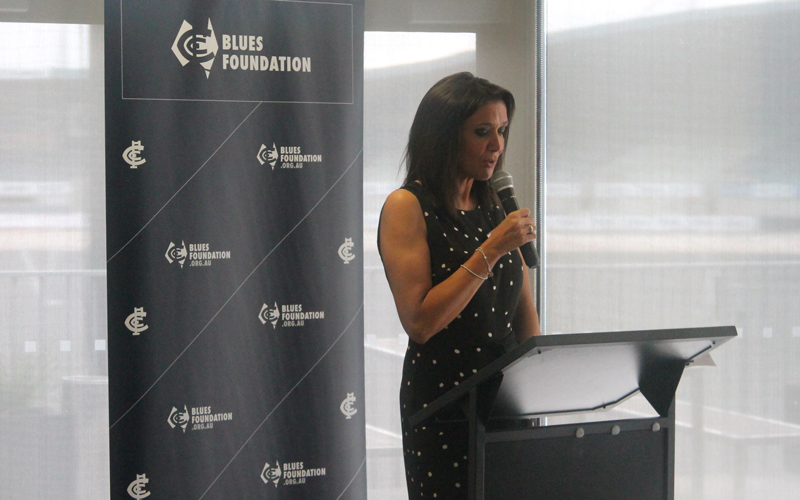 To mark the beginning of the 16 days, Carlton FC held a whole-of-club morning tea, including players and staff, as well as Blues Foundation corporate donors of the Blues Foundation and CARLTON RESPECTS program. The morning tea was hosted by Master of Ceremonies Shelley Ware. The campaign is timed to coincide with the global 16 Days of Activism against gendered violence campaign. It starts 25 November the International Day for the Elimination of Violence Against Women until Sunday 10th December, International Human Rights Day. “More than a Spectator” supports Our Watch’s campaign, concentrating on sporting codes and fans to challenge sexism, inappropriate attitudes and behaviours against women. Director, Practice Leadership, Our Watch, Patty Kinnersly discussed findings from the recent study, A team effort: preventing violence against women through sport. The study analyses current initiatives and literature and provides 10 key actions that sporting organisations and communities can take to help prevent violence against women. To spread the message, make sure you use the hashtag #MoreThanASpectator and #CarltonRespects on social media, to this very important campaign – Carlton players, Blues Foundation Ambassadors and corporate donors will all be getting behind the cause via Facebook, Instagram and Twitter.